Well, Character Group’s MD Jon Diver has now answered this important question. Absolutely, yes, there will be a “generic mercenary figure”, says Jon. 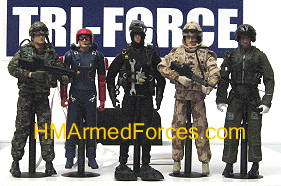 The HMAF Mercenary figure will be “dressed in black” and fans will be anxious to know that he’ll be fighting for retail shelf space in time for Xmas 2009.